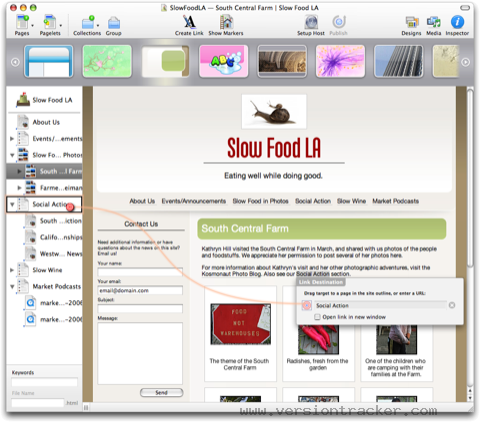 [prMac.com] Karelia Software announces the release of version 1.2.4 of Sandvox(R), its award-winning website creation software for Mac OS X, now Leopard-ready. Released on the heels of Leopard, the latest and most dynamic version of Mac OS X, Sandvox version 1.2.4 offers many enhancements. Users of prior versions will see improvements to site designs and design elements, will benefit from bug fixes and other optimizations, and experience improved compatibility with iPhoto '08 and other iLife applications. As with every new version, Karelia has also updated its Help feature to offer users extensive documentation at their fingertips. Sandvox features drag-and-drop website assembly, live editing without a preview mode, over forty stylish designs, and seventeen different types of Pagelets. It's the easy, elegant website creation tool for people who want to spend time developing their lives, not their websites. Sandvox 1.2.4 is available for downloading and purchase from Karelia's website in both Regular and Pro editions. Single-user licenses are US$49.00 and US$79.00, respectively. Household licenses (allowing multiple users in one household) and site licenses are also available. The Sandvox Bonus Design Pack has also been updated for improved browser compatibility. Sandvox users who wish to download a new version of these additional five designs can fill out the form at http://www.karelia.com/bonus_designs.html to receive the designs via email. Sandvox 1.2.4, a Universal Binary for PowerPC and Intel architectures, requires Mac OS X "Tiger" version 10.4.4 (and above) or Mac OS X "Leopard" 10.5. Sandvox comes in eight localizations: English, French, Italian, Danish, German, Japanese, and both Simplified and Traditional Chinese. More information about Sandvox is available at Karelia's website (created with Sandvox, of course).